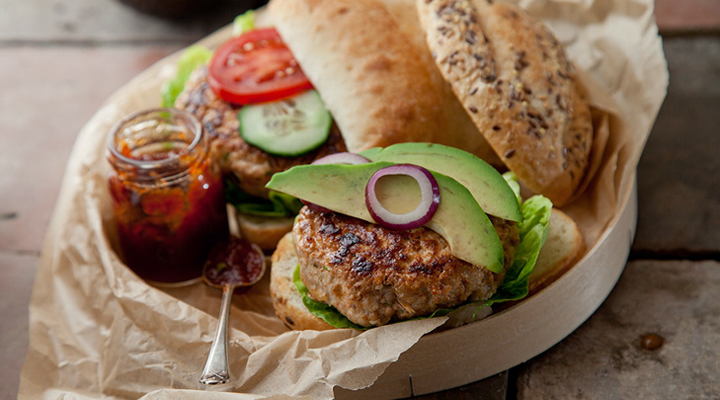 Turkey burgers are full of flavour when you use different seasonings in the recipe, but if you prefer, beef mince may be used here instead. Add your favourite toppings to this burger for the perfect Friday fun meal. Place the turkey, onion, chilli (if using), garlic, coriander, paprika, worcestershire sauce and salt in a large bowl and mix until just combined. Try not to handle the mixture too much or the burgers will be tough. Form into 8 evenly sized burgers. Heat the oil in a large frying pan set over a medium heat. Working in batches so that you don't crowd the pan, cook the burgers for 5 to 10 minutes per side, until they are thoroughly cooked through. Serve on the toasted burger buns and your favourite toppings. This is the best alternative to beef burger! It turned out perfect, and no one ever questioned what kind of meat it was? Thanks so much!